Wijngaard Cheese is a family business with a long tradition of artisan cheese making going back more than 100 years. The current Wijngaard brothers who run the cheese business are the 3rd generation that are responsible for these fine, award-winning Gouda cheese. The cheese of the Wijngaard family are made from milk from grass-fed cows. Cows fed on fresh grass give milder and better milk and cheese made from this milk ripens better. Milk supply of this type of milk is limited, since summers are not that long in Holland. The cheese is ripened in historic, custom-built cheese cellars in the historic town of Woerden. It is the unique micro-climate in these cellars, with fluctuating temperature and humidity, that influences the flavor of the cheese greatly. If you ever visit Amsterdam, go to the Reypenaer Tasting Room in center of Amsterdam where you can personally test and evaluate the flavor, the aroma and the qualities of the Reypenaer cheese, all under the guidance of an expert cheese taster. Reypenaer V.S.O.P. is truly a Dutch gourmet cheese showpiece. Magnificent and well deserved of the V.S.O.P. designation. This delicious gourmet cheese from the Netherlands is matured for about 2 years and during that maturation sheds approximately 25% of its original weight. The white spots you will see on the surface indicate the start of mineral and protein crystallization. In comparison to most cheeses that are aged from a few weeks to a few months, this is a masterpiece long in the making. 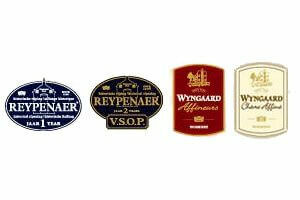 We also have a Reypenaer, aged for just 1 year and already tasting 'old'. Aroma and flavor are superb. Sharp and tangy. Well recommended and arguably one of the greatest Dutch hard cheeses. We cut and wrap Reypenaer V.S.O.P. in wedges of approximately 1 pound and 8 ounces.